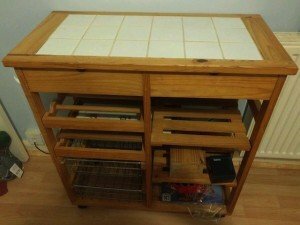 A solid wood kitchen butcher unit on castors, tiled to the top with under storage shelves and pull out metal baskets. 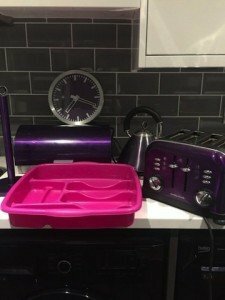 A small collection of kitchen accessories, to include a metallic purple four slice toaster, a kettle, a bread bin, a wall clock, a kitchen roll holder and a cutlery drawer. 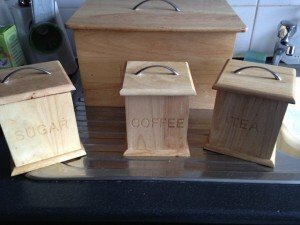 A set of five farmhouse style solid wood kitchen canisters with chrome handles, include a bread bin and tea, coffee and sugar canisters. 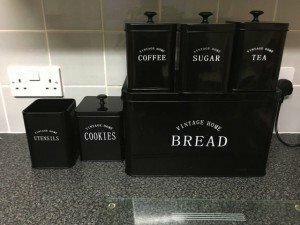 A collection of black metal kitchen canisters, to include a large bread bin, a utensil holder, a cookie jar and tea, coffee and sugar canisters. 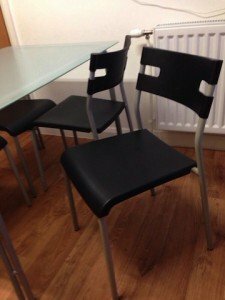 A large glass and chrome dining table, together with four matching dining chairs upholstered in black faux leather. 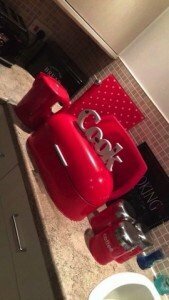 A collection of red kitchen accessories, to include a kettle, a large bread bin, a white cook ornamental plaque, a red and white polka dot chopping board, a sink dish and tea, coffee and sugar canisters. 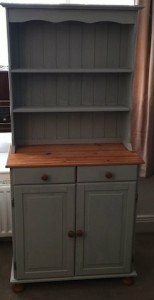 A solid pine Welsh grey kitchen dresser in the shabby chic style, having two shelves above a bench, two small drawers above two cupboard doors. 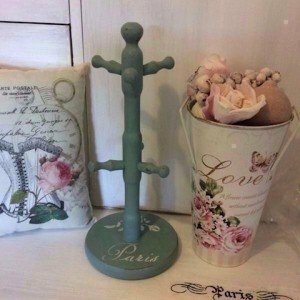 A small collection of decorative shabby chic accessories, to include a green wooden cup holder, a patterned metal bucket vase with faux flowers and a printed throw cushion. 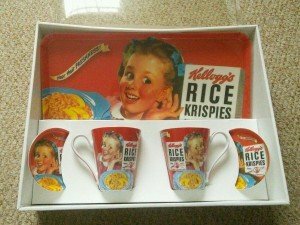 A brand new boxed Kellogg’s gift set, includes two large coffee mugs, two coasters and a large tray. 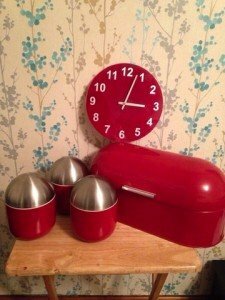 A small amount of red kitchen accessories, to include a large bread bin, a wall clock and tea, coffee and sugar canisters with stainless steel lids. 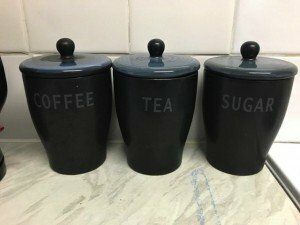 A set of three black ceramic tea, coffee and sugar canisters each with writing on them. 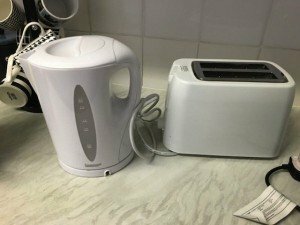 A white 1.5 litre electric kettle and matching two slice toaster. 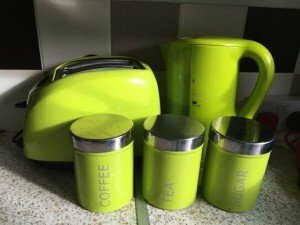 A collection of lime green kitchen accessories, to include a kettle, a two slice toaster and tea, coffee and sugar canisters with stainless steel lids. 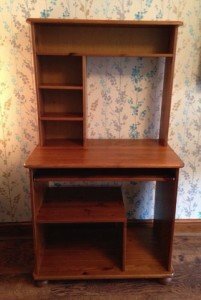 A solid pine vintage desk unit, having four shelves above a desk, a pull out keyboard shelf and three shelves under, on ball feet. 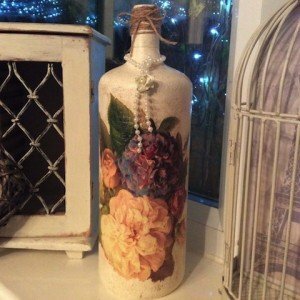 A large shabby chic style bottle shaped candle holder, decorated with colourful flowers. 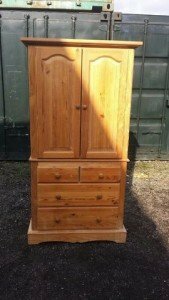 A solid pine tall standing double wardrobe, having two doors above four drawers. 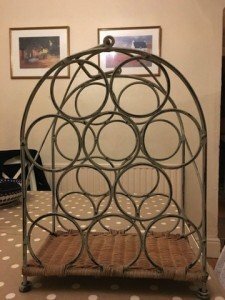 A wrought iron and wicker table top oval wine rack, having ten bottle holders. 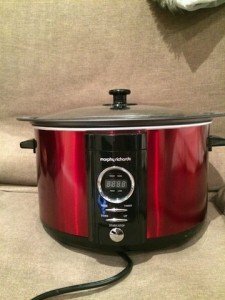 A red and black metallic stainless steel Morphy Richards round slow cooker with digital timer. 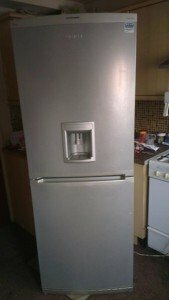 A tall standing silver Beko slimline fridge freezer with built in water dispenser. 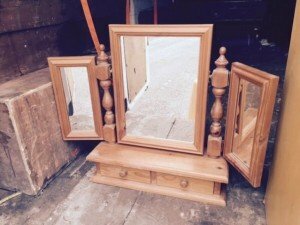 A solid pine tri folding bevelled vanity mirror on a plinth with two small drawers.